Doha, State of Qatar -- The National U.S.-Arab Chamber of Commerce (NUSACC) today issued a first-of-its-kind report that highlights emerging knowledge-based societies in the Middle East and North Africa (MENA) region. The report was launched on the sidelines of the World Innovation Summit for Education (WISE) taking place in Doha, Qatar. "The Arab world is making important strides as it transitions from hydrocarbon-based economies to knowledge-based societies," asserted David Hamod, President and CEO of the National U.S.-Arab Chamber. "These nations have come a long way in a short period of time in their efforts to prepare their citizens for the challenges and opportunities of the twenty-first century." NUSACC's new 28-page edition of U.S.-Arab Tradeline, the Chamber's quarterly newsletter, highlights how countries such as Qatar, Jordan, Egypt, Morocco, Bahrain, and the United Arab Emirates (UAE) are breaking new ground in education reform, in building state-of-the-art information and communications technologies (ICT) infrastructures, and in supporting research and development (R&D). The Chamber's newsletter looks at trends in nine Arab nations and includes interviews with ministers, ambassadors, and senior leaders in academia and the private sector. According to the World Economic Forum (WEF), four Arab countries - Qatar, the UAE, Bahrain, and Kuwait - are among the top 50 nations in the world most ready to utilize ICT, one of the essential pillars of a knowledge society. In 2008, the most recent year for which data are available, the Arab world demonstrated higher levels of development in ICT performance than those observed in any other region of the world, says the Arab Knowledge Report 2009. "In the 21st Century, classification will be on the basis of information: societies with knowledge, and others without," said H.H. Sheikh Mohammed bin Rashid Al Maktoum, Vice President and Prime Minister of the United Arab Emirates and Ruler of Dubai. "Our region's success depends on creating an environment conducive to acquiring knowledge and on providing tomorrow's leaders with motivation to build a better future." "Through education, through the pursuit and attainment of knowledge, all things become possible," emphasized Qatar's First Lady and Chairperson of the Qatar Foundation, H.H. Sheikha Mozah Bint Nasser Al Missned. "The sharing of knowledge, ideas and values is the noblest way to transcend barriers." ​H.H. 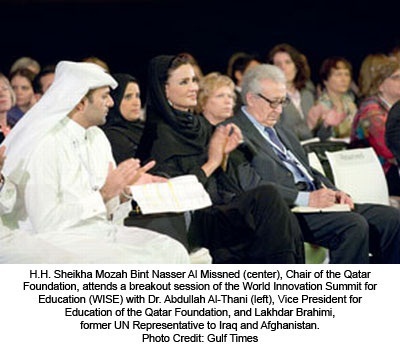 Sheikha Mozah is the driving force behind WISE - the World Innovation Summit for Education - taking place in Doha this week. The Summit has brought together more than 1,250 stakeholders from around the world whose goal is to create a new international multi-disciplinary platform to shape education models of the 21st Century. 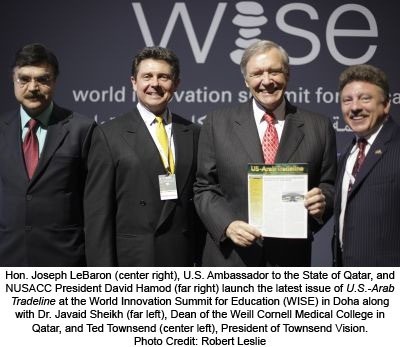 "The WISE Summit is strong evidence of the tremendous growth in knowledge in Qatar and in the MENA region," asserted Dr. Javaid Sheikh, Dean of the Weill Cornell Medical College-Qatar (WCMC-Q). "We welcome the opportunity to use the college's triple mission of pursuing excellence in education, research, and clinical care to support H.H. Sheikha Mozah Bint Nasser Al Missned's vision of creating a knowledge-based society in Qatar that is capable of sustainable development." Dr. Sheikh and the Honorable Joseph LeBaron, U.S. Ambassador to the State of Qatar, participated in the launch of NUSACC's latest newsletter. Ambassador LeBaron stated, "As their annual hosting of the WISE conference suggests, Qatar is one of the region's greatest success stories in educational initiatives. Qatar's innovative initiatives foster a knowledge-based economy. They also cultivate the next generation of community leaders in Qatar. The United States is eager to support the ever-expanding education and commercial relationship with Qatar. The two are so important, to both countries." The Arab world's growing commitment to knowledge-based societies is the focus of the groundbreaking Arab Knowledge Report (AKR) 2009 - Towards Productive Intercommunication for Knowledge, published by the Mohammed bin Rashid Al Maktoum Foundation in cooperation with the United Nations Development Program (UNDP) Regional Bureau for Arab States. "The report was produced by the Arabs and for the Arabs," emphasizes Amat Al Alim Alsoswa, Assistant Secretary-General and Regional Director of the Regional Bureau for Arab States, who notes that the report relied on the expertise of more than 100 Arab scholars and specialists, as well as a 30-member Advisory Board from the Arab world. "Establishing a knowledge society and a knowledge-based economy is an inevitable path for the Middle East and North Africa (MENA) region if it really wants to engage in meaningful human development and catch up with the rest of the world," asserts Alsoswa. "This is the only path to success through the challenges of the third millennium." ​The newsletter focuses on a number of signature initiatives in the region that underscore a commitment to creating 21st Century knowledge-based societies - the Masdar Institute of Science and Technology in Abu Dhabi, El Hassan Science City in Amman, Jordan, Education City in Qatar, Weill Cornell Medical College in Doha, as well as Maadi Technology Village and Smart Village in Egypt, to name just a few. Exclusive NUSACC interviews include those with: Dr. Javaid Sheikh, Dean of the Weill Cornell Medical College in Qatar's Education City; Dr. Fred Moavenzadeh, President of the Masdar Institute; with Dr. Safwan Masri, Director of the Amman, Jordan-based Columbia University Middle East Research Center; and Dr. Alfred Bloom, Vice Chancellor of NYU Abu Dhabi. These interviews illustrate the growing involvement of America's educational sector - from community colleges to universities and research institutions - in the MENA region. "American education is one of our most valuable exports, not just because of its high quality, but because of the way it supports the creation of knowledge-based societies," comments Tamara Cofman Wittes, Deputy Assistant Secretary of State for Near Eastern Affairs at the U.S. Department of State. The newsletter features articles on American community colleges that are building bridges to similar entities in the MENA region, as well as an article profiling the U.S. State Department's Middle East Partnership Initiative (MEPI). "Some of today's most ambitious projects in the Arab world revolve around the diffusion of education and the region's gradual transition to a knowledge-based society," says NUSACC President and CEO David Hamod. "This transition will encounter some challenges along the way, to be sure, but it is reassuring that leaders in the MENA region are looking forward to facing these challenges head on."